Breakfast is the most important meal of the day. And, luckily for me, it’s also my favorite. I’m instantly ready to chow down. But, not everyone feels this way (my brother prefers a solid hour or two to wake up) and there are a million excuses for skipping it during the week when you’re racing out the door to: walk the dog, drop off the kids, beat rush hour traffic or subway madness and get to work on time without forgetting your heels, phone, etc. (insert yours here). But, a reasonable breakfast that combines a mix of both complex carbs and protein will give you a quick shot of energy (raising blood sugar to get you going), followed by a slower-processing energy boost from high fiber (which slows digestion and keeps you from feeling totally famished/slightly faint by 11 a.m.). This doesn’t have to take a lot of time, planning or even any cooking. And, it can also be portable (sorted into small plastic bags at home and mixed in a bowl kept in your desk drawer–remember, it’s chic to DIY). One of my go-to favorites is a yogurt parfait made with a mix of satisfyingly crunchy, ever-so-slightly sweet cereal and fresh fruit, layered over low-fat plain or fruit-flavored greek yogurt. Here’s one that I had today at a delicious, fancy brunch downtown, plus, the ingredients that I always keep at home to enjoy it every day. Tomorrow, rise AND shine. 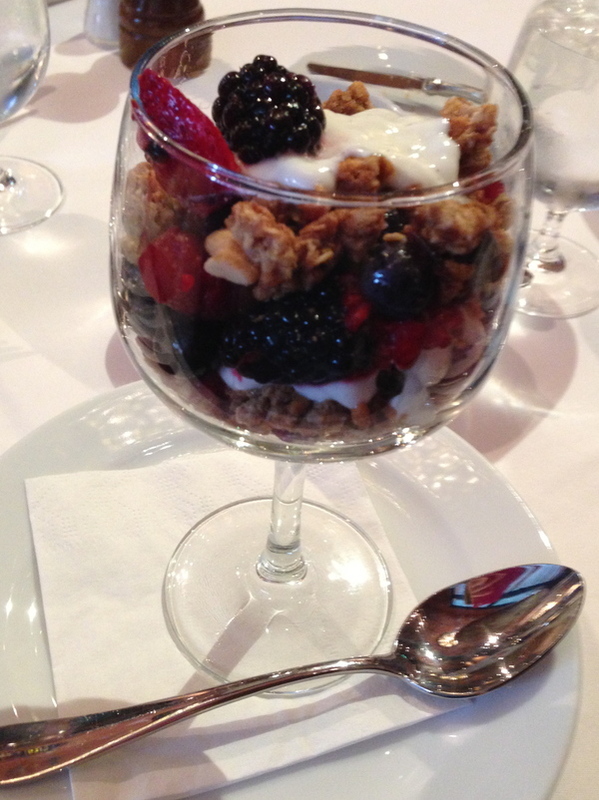 Adore fresh, mixed berries. And, beautiful presentation. Ate the whole thing, no problem. 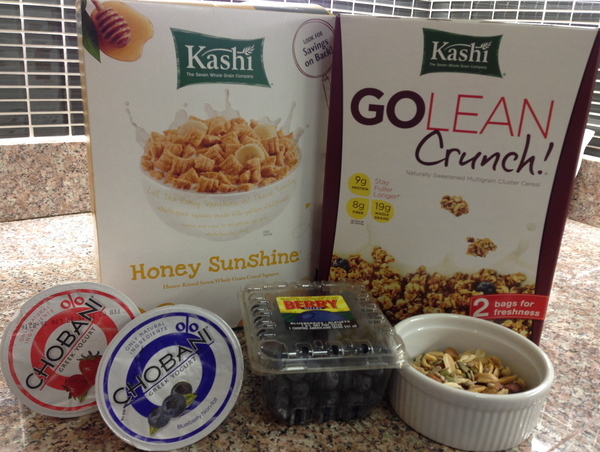 I’m the ultimate Kashi girl. I love all of their cereals, snack bars, everything. Chobani is also my favorite brand of Greek yogurt. Apparently, other New Yorkers agree–Chobani now has a yogurt bar in Soho, where they custom-mix yogurt concoctions like Peanut Butter + Jelly and Toasted Coconut + Pineapple while you wait!